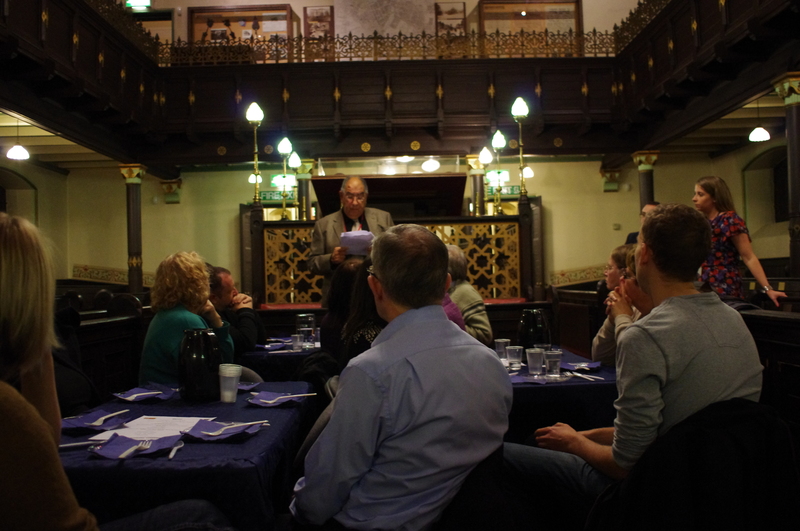 ‘Secrets from a Kosher Kitchen’ on Monday 10th October was the Manchester Jewish Museum’s contribution to the Manchester Food and Drink Festival. The event was a way to introduce Jewish tradition and culture as well as the idea of Kosher food and what determines wether a meal is Kosher. For a (lapse) Catholic boy like myself, this sounded like a very different cultural and culinary experience. The main hall where we sat reminded me of being taken to church as a child. The rich smell of the wooden benches and the feel of worn carpet underfoot on an uneven floor made me feel strangely nostalgic in unfamiliar surrounding. The meal began with an introduction to the two styles of cooking we would be eating. Ashkenazi (Eastern European Jewish) food and Sephardi (Middle Eastern Jewish) food. What I would love to do now is fly into an illustrative description of the cuisine and its cultural significance but there the sheer volume of information we were presented with on the night (whilst eating) means that I am having trouble putting it into a narative. So instead, I’ll try to put what I can into the descriptions of the food. Each course was a small taster to introduce some of the flavours of these two cuisines. The requirements of Kosher law meant that Ashkenazi and Sephardi cuisine developed from the foods which were available which could be prepared to be Kosher in those regions. 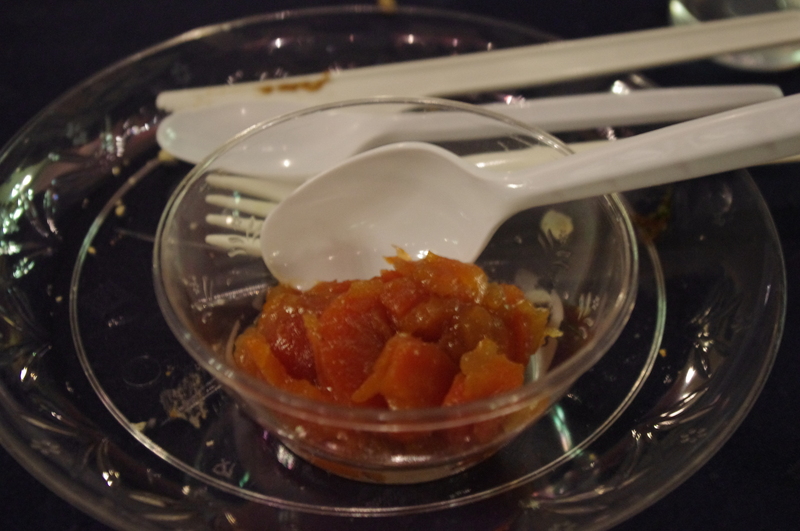 One thing that was made clear to at the start of the evening was that there/ isn’t really such a thing as a Kosher dish. Its not really about the type of food, more how the food is prepared and the treatment of the food. Therefore, you could make a Kosher dish out of almost any dish. However as we worked through the menu, there were a few dishes which could be called ‘traditionally’ Jewish. The chopped herring with matzo crackers and chrane mixed the dry crisp crackers with an unusual lightly sweetened fish, a combination I would never have put together. Even that most recognisable of dishes known as Jewish penicillin: Chicken soup. The great broth with noodles and filling dumplings made me feel like I should have been wrapped in a warm blanket next to a roaring fire. The real surprises of the evening were the dishes I wasn’t expecting. Tzimmes was a revelation to me. A dish of chopped carrots mixed with sugar and dried fruits. The carrots are cut into rounds and are meant to look like coins. 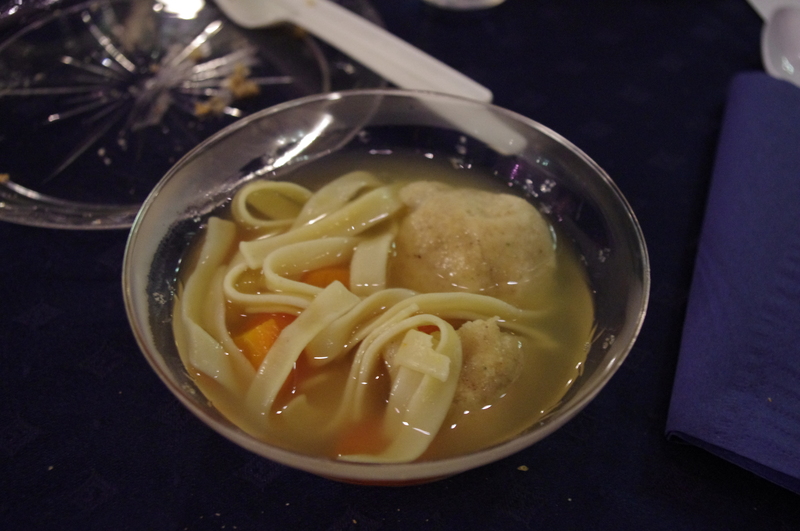 This is a common Jewish New Years dish to symbolise prosperity for the new year. I certainly prospered from having tasted these (Sorry, bad joke – and they were a bit too sweet). 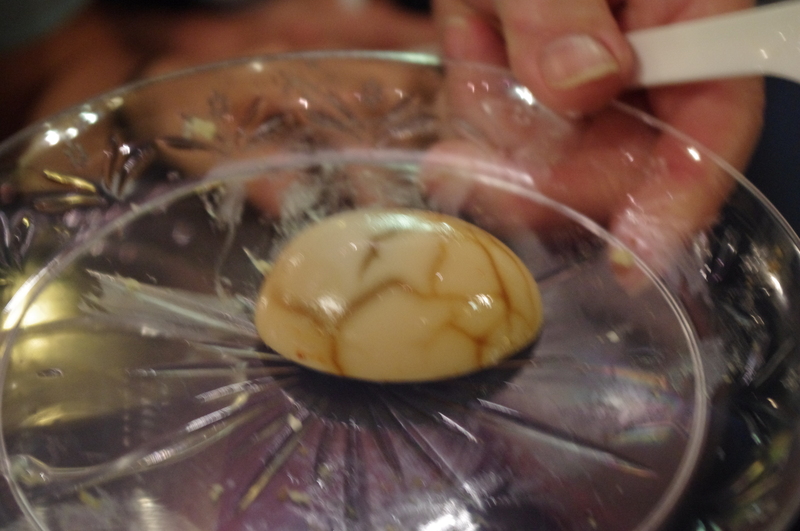 The Hameen (Hamine) eggs were another great example. A Saphardi dish in which the eggs are boiled in their shells over night in a meat stew, they take on the flavour and colour of the stew, with some developing a marbled effect. The baked omelette was a really unusual dish. 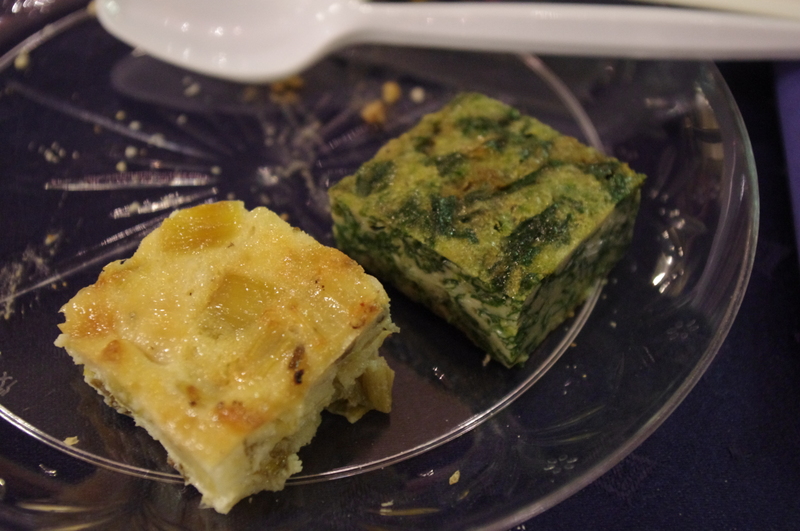 Served cold, these two omelettes made with spinich and leek were another example of a dish you wouldn’t expect to be sweet but really was. this was particularly true of the leek, which tasted close to caramalised onion was not my favourite dish of the evening, but like most of the dishes on this menu, it was like nothing I had tried before. The highlight of the evenings food was the sweet and creamy cheesecake, ahh the cheesecake, if they’d served it in table sized portions i would have belly flopped into it before doing my best Pacman impression. 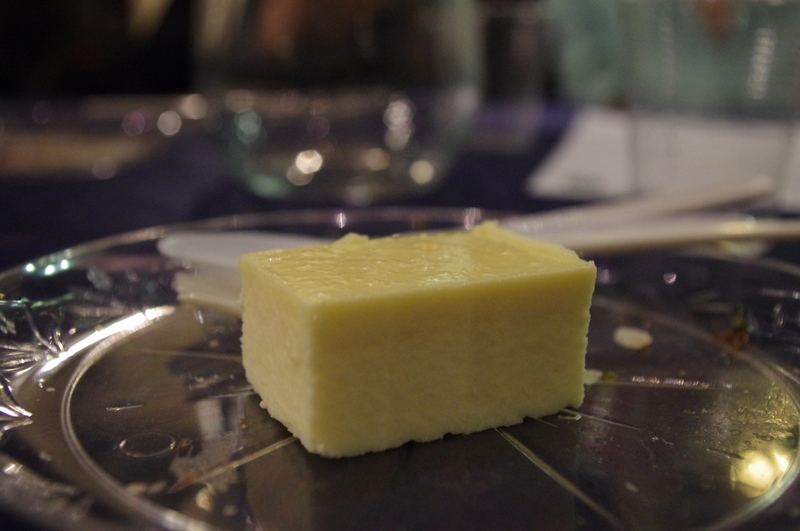 The cake has no base, is pure cheese-cream and is perfectly sweetened and is available from Kosher Delights on Leicester Rd, Prestwich. All of the dishes, the descriptions and the people we got to eat with were what made this a great evening. It was a meal that was also an experience, and all good meals should be an experience. ← What’s with the bacon, Mr Black?